Is social media taking over the web? Just in the last year, the number of social media users has continued to climb at record speed and the audience demographics have widened. And marketers have noticed the trend. For proof of social media’s steep rise, take a look at the number of statistics that surfaced in the last month. These findings further support what most of us already believe: Social media is only getting bigger. Nielson Company, in their report “Internet & Social Media Consumer Insights,” just released some impressive data on social networking activity in the U.S. The company reported Internet users spent an average of 6 hours, 13 minutes on social networking sites, just in the month of May 2010. That number was just 3 hours, 31 minutes last year. In addition, the research showed the average U.S. worker spends almost 5.5 hours a month visiting social network sites from the office. Perhaps the efforts of many companies to ban social networks from the workplace might not be achieving the goal! The data confirmed that Facebook is still the leading contender of social networking sites with a unique audience of 125.2 million visitors. Twitter has a unique U.S. audience of 19.1 million visitors (May 2010). This is a massive growth of more than 1,520% in the last two years! 75% of all active U.S. Internet households visited a social networking site in May 2010. How does that compare globally? In April 2010, the global number was 74%—almost identical to the U.S. percentage. 22% of the time spent online is attributed to social networking sites. 20% of U.S. adults online publish or own a blog. 55% have at least one or more social networking profiles. 20% of those surveyed frequently provide advice about movies, 18% share their opinions about TV shows and 16% often advise others about music. Facebook, YouTube, and Wikipedia have made the list of top online brands, according to a recent Nielson report. 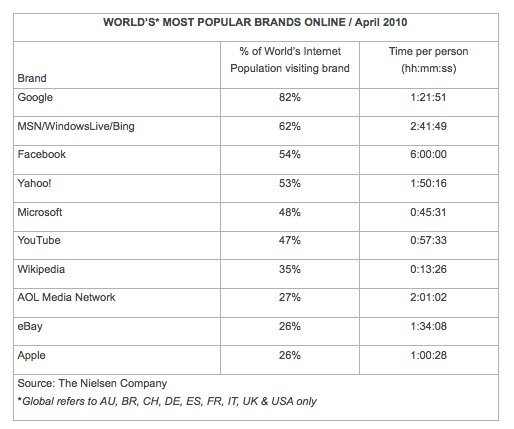 Out of the top online brands such as Google, Apple and Yahoo!, users spent the most time on Facebook per month than any of the other online brands. That’s pretty impressive considering Google’s and Apple’s worldwide popularity! Considering that Facebook and YouTube are leading contenders with online powerhouses such as Google and Yahoo!, there's no doubt social networking is moving ahead at record speed! Have you ever wondered how the U.S. compares to other countries in terms of social networking usage? It turns out that Brazil is actually the most active, with 86% of Internet users visiting social networks. 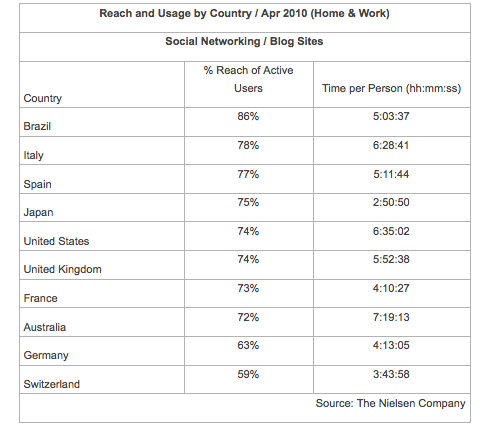 And Australia takes the lead for most time spent on social networking sites. They clocked in at 7 hours, 13 minutes in April 2010! When it comes to Facebook’s reach, Italy takes the lead, having two-thirds of the active unique audience in April 2010. Close behind are Australia, the U.S. and the UK with over 60% of active online consumers. Take a look at the chart below to see how other countries compare. Brazil is leading the way in active social networking users; however, Australia steals the lead for time spent on the networking sites. In eMarketer’s recent report, “Social Network Demographics and Usage“, it was estimated that 127 million people (57.5% of Internet users) will visit a social networking site at least once a month in 2010. They attributed the steady rise since 2009 as due in part to the ever-increasing popularity of Facebook. Not only is the number of users growing quickly, but also the audience demographics continue to widen from just teens and young adults. 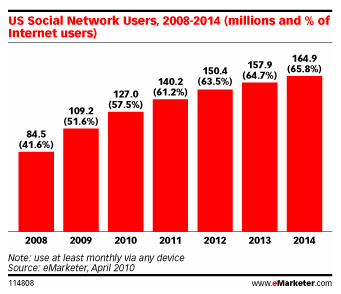 In 2010, they estimated that 59.2% of adult Internet users will visit social networks monthly, up from 52.4% in 2009. The estimates outlined in the report show a steady rise by 2014. Two-thirds of all Internet users (164.9 million people) will be using social networks on a regular basis. Two age groups stand out the most: In 2014, 56.8% of 55- to 64-year-old Internet users will visit social networks regularly (34.3% in 2009). 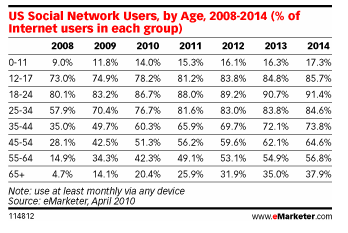 In addition, 37.9% of seniors 65 and up will be social network users (14.1% in 2009). These two graphs show the steady rise in social networking use by 2014. Now it’s your turn. What do you think of these stats? Will the rise of social networking sites continue? Will you continue to increase your social networking usage? Leave your comments below—we want to hear from you!